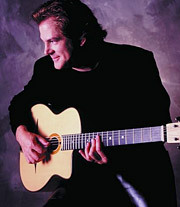 He's one of the pioneers of the American gypsy jazz movement and is considered a modern master of the guitar. Join as The GRAMMY Museum welcomes the remarkable John Jorgenson to The Clive Davis Theater. Known for his incredible versatility across a wide variety of styles, artists like Barbra Streisand, Bonnie Raitt, Billy Joel, and more have sought out his guitar work for both touring and recording projects. Audience members will hear Jorgenson in conversation about his career development, his latest release One Stolen Night, and founding genre bending groups such as the Hellecasters and the Desert Rose Band. After the interview, Jorgenson will take questions from the audience and perform a couple of songs. GRAMMY Foundation and MusiCares Vice President Scott Goldman, a great guitarist himself, will conduct the interview.